Over 8-14 September, Melbourne accidentally on purpose became the city of choice for a dozen tea-related events. Melbourne Tea Week! Where to begin? Well for starters being forced to endure a tea week is always better than being forced to endure a weak tea and if you hate tea puns, you should exit this page right now. To be clear, Melbourne Tea Week was not a co-ordinated affair, at least not like Melbourne Fashion Week or the Melbourne Fringe Festival – two events it was sandwiched between – but Fine Food was the sun that helped the good tea-ple of Melbourne find an orbit. Fine Food, as well as hosting the World Tea Brewers Championship for the third year running, also attracted the Australian International Tea Expo and the Tea Masters Cup as part of its Drinks Collective side event. Last year, the Australian Tea Cultural Seminar members voted Melbourne the host city for 2018 and September the best month so picking a weekend that would dodge two footy codes’ grand final weekends and leading into Fine Food made sense. In view of these three anchor points, the fringe grew. Because I’m an AUSTCS co-director, many people ask me what it is. It’s really quite hard to describe until you’ve been to one. Primarily, it’s a forum for the tea community – comprised of both industry and the tea-loving public – to band together and develop a tea-drinking culture. But on a secondary note, it’s couched in tea appreciation and a respect for affiliated areas, both cultural activities outside of tea and tea cultures from outside Australia. It began, as every gathering should, with tea. 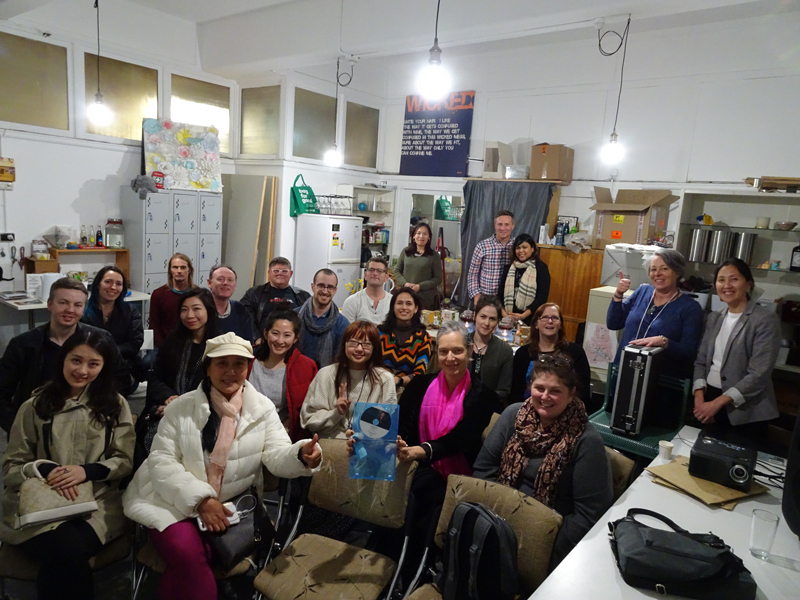 After The Savoy Hotel’s art deco foyer embraced this year’s cohort for a group photo, AUSTCS delegates sat down and enjoyed the unboxing of the 2018 cup by ceramicist Annemieke Mulders. It provided an important focal point for our opening ceremony, ‘Welcome by Tea’, with tea at each table selected and served by volunteer brewers. Chosen through a competition we ran in conjunction with the Australian Ceramics Association, Annemieke’s submission fit both the technical criteria for size and durability (microwave/dishwasher safe!) but most importantly aesthetically, for its representation of Australia. Her winning entry, which depicted glaze in a hue and pattern reminiscent of sea foam, was replicated in some of her delegate cups. 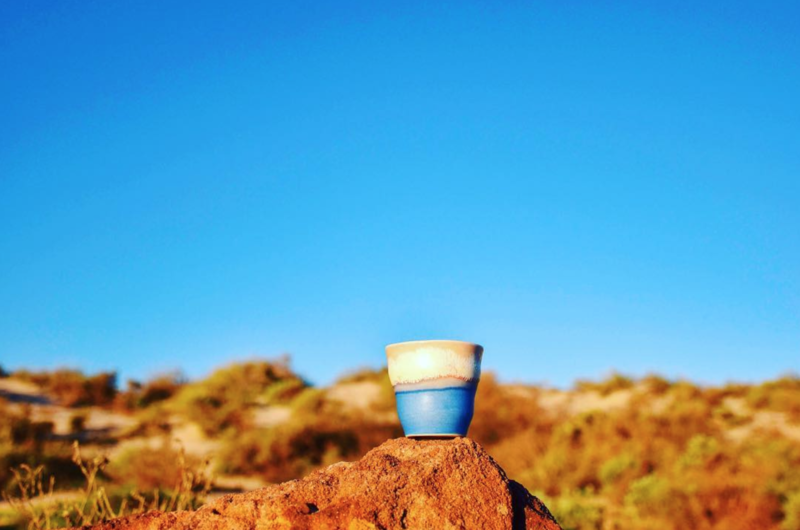 She explained the genesis of the designs in her presentation, how her surroundings in Western Australia – the land, the sky, the sea – served as inspiration for the glaze colours and how experimentation with the glaze combinations made every cup unique. The ‘wow’ factor at the unboxing was a hard act to follow, but Annemieke’s enlightening presentation certainly made everyone appreciate their AUSTCS cup even more and many unsurprisingly spent the break busily buying additions for their collection. Our first international guest speaker, tea practitionerJeni Dodd, hails from Kansas via New York via the world. Her presentation on The Art of Tea focused on the aesthetic experience we have when appreciating art being akin to the bodily effect of drinking a cup of tea. Starting with the question ‘what does art do to us?’, Jeni drew a number of parallels between the craft of artistry and the craft of creating tea, the emotional response we have to art and the emotional response we have to tea. Both art and tea, she said, transform and translate worlds using a universal, sensory language. Chloe Liang from the China International Tea Culture Institute (CITCI) followed. She started with the context of a pre-1980s view of tea as a government commodity, even while many different areas of China displayed a wide array of tea practices, from eating tea (Jinuo) and cooking with tea (Wa) to performing sacrificial rites (Yunnan) with tea to honour nature. Since then, tea has modernised and there’s greater recognition of the diversity of tea culture that comes under the umbrella CITCI provides. The good news? There are now more than 100K teahouses in China, a twentyfold increase compared to 30 years ago. A lot of this is due to exposing younger people to tea culture, says Chloe, from university tea culture clubs to experimenting with beverages such as tea cocktails to make tea more fashionable. And there’s a significant demand for skilled tea service in professional settings too, with large organisations like the Bank of China using tea to “close the gap with their customers” and tea used in diplomatic situations between President Xi Jinping and his international counterparts. Tea, it seems, is enjoying a renaissance in China, and we hope it is a harbinger of what’s to come in Australia. Day two was for workshops, which is where the forum kicks in: members have their say and form a strategy and some goals to work on throughout the year. These are split into three streams: education, culture and health & wellbeing. I facilitated the culture workshop and I must admit I held back this year compared to 2017. We had a great group last year and some lofty ambitions and then all but one member dropped out: lofty = too hard. This year I shaped some smaller goals like bonsai but made sure everyone contributed their experience so we could take into account different perspectives. I am interested in the tipping point of what makes a habitual tea drinker an aficionado – or not, in other cases – and it was good to hear everyone’s stories about what tipped them in and what they thought has kept other people out. The other thing I wanted to avoid was just making our goals about ‘awareness raising’ (blergh! next to useless!) re: finding and drinking quality tea, I was super keen to get some practical follow-up so that those looking to level up could do so rather than just wallowing in all the 101 stuff that litters almost all the info we get about tea. Organised for AUSTCS delegates, this special screening of Jeff Fuchs’ documentary The Tea Explorer, about travelling along the ancient Tea Horse Road, was preceded by a wander through some of Melbourne’s most iconic laneways (Hosier Lane for the art, Central Place for the foodie stops). Libertea and Tuocha sponsored the screening and their tea flowed freely. Host Tania Stacey invited them up to have a chat about their tea journeys, which was a nice way to introduce them to the tea community. I personally felt the doco needed more on the journey and the people along it than the beginner’s tea lesson that took up the first third, but also understood why they needed to include those segments for a non-tea-drinking audience. I hope all those interviews Fuchs did with old-timers on his travels are one day pushed out as mini-docos as part of a TV series or similar. It would be a waste not to share them with the world, particularly as they are at a risk of being lost. BRB, trying to hunt down a copy of his book. This entry was posted in drinking, travel and tagged AUSTCS, expo, film, WTBC. Bookmark the permalink.